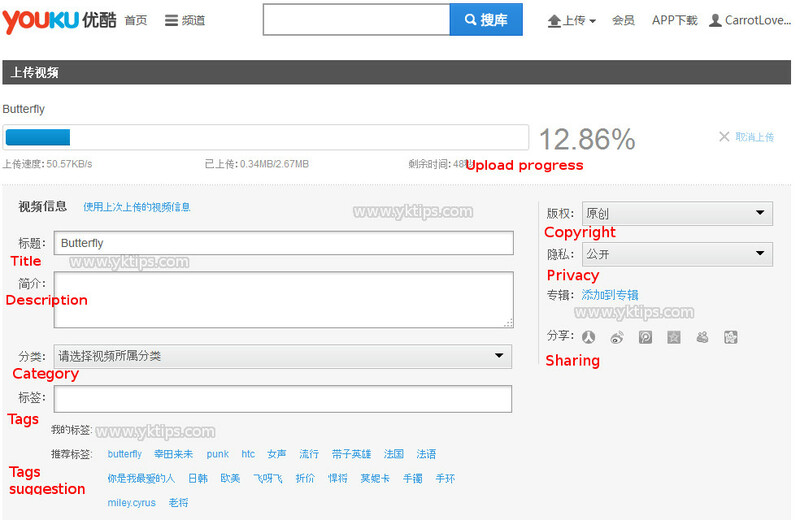 In this guide you will find on how to upload a content files to Youku. 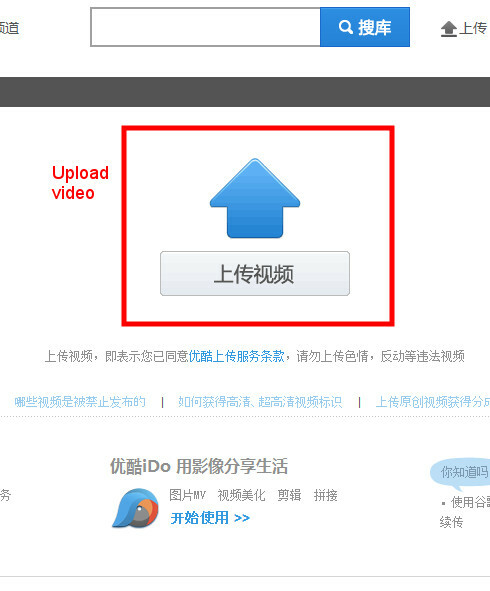 To upload video Youku you need to follow this English guide. This is an easy process, where this English guide provides you with clear instructions and translated images about uploading videos, choosing the right categories and writing the right titles and tags. 1. Upload video Youku: Go to the upload page. If you didnt create an account on Youku, you should do that first. Click here for the guide for creating an account. You enter a page where a huge blue arrow appears. Click on that to choose the video file you want to upload. Alternatively you could drag your file into the blue arrow. You enter a new page where your video is uploading. Now you are waiting for your upload to complete, you can give your video a title, description, tags and a category. You can see in the image where you need to enter what. See this picture, it is self-explanatory. You can enter these fields by writing down your title, description and tags. The category options is a dropdown menu, choose the category which fits the most to your video upload. You can view categories on the image below for explanation. Then there are these options, you don’t have to do anything about it. 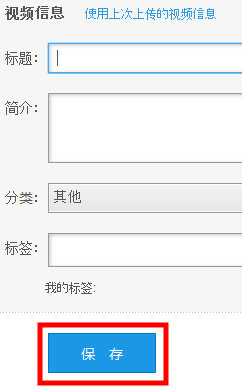 隐私 – Privacy (first option, everybody can view, second option: Only friends can view, third option: password protected). 分享 – Share (Share through Chinese social media options). 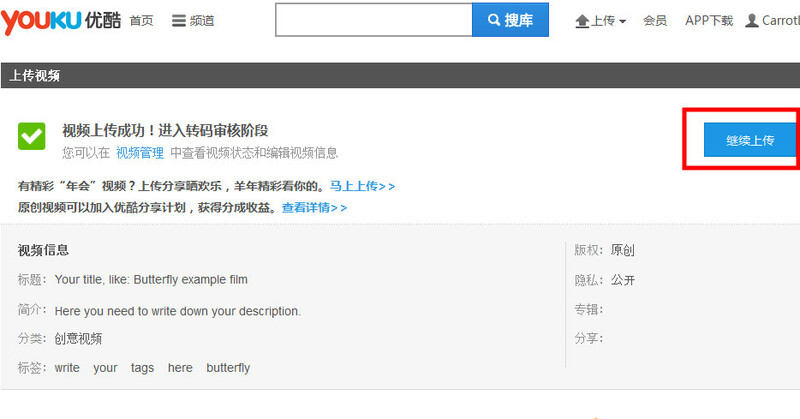 You have the option to provide Chinese titles, description or tags. What is the best way to do that? Google to Google Translation and translate it from your language into Chinese. Just copy-paste your title and description. The translation is quite accurate.The tags the best you can do is to translate each keyword into Chinese and paste that into the tag textbox. That’s also accurate. When the upload status bar reaches 100%, you are able to click on the blue confirmation button, see image above. This means you have completed your video upload to Youku. If you click that, the site will lead you to the confirmation page. Upload video Youku is complete! If you press the blue button you will return to the upload page. You might want to continue to manage your channel and videos. You can also continue to read how to earn money with your uploaded content.